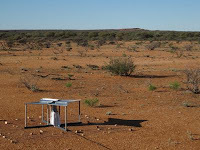 Arizona State University's Judd Bowman and Alan Rogers of Massachusetts Institute of Technology have developed a small-scale radio astronomy experiment designed to detect a never-before-seen signal from the early universe during this period of time, a development that has the potential to revolutionize the understanding of how the first galaxies formed and evolved. 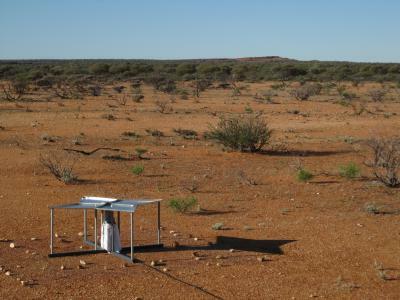 Bowman and Rogers deployed a custom-built radio spectrometer called EDGES to the Murchison Radio-astronomy Observatory in Western Australia to measure the radio spectrum between 100 and 200 MHz. Though simple in design – consisting of just an antenna, an amplifier, some calibration circuits, and a computer, all connected to a solar-powered energy source – its task is highly complex. Instead of looking for early galaxies themselves, the experiment looks for the hydrogen gas that existed between the galaxies. Though an extremely difficult observation to make, it isn't impossible, as Bowman and Rogers have demonstrated in their paper published in Nature on Dec. 9. "This gas would have emitted a radio line at a wavelength of 21 cm – stretched to about 2 meters by the time we see it today, which is about the size of a person," explains Bowman. "As galaxies formed, they would have ionized the primordial hydrogen around them and caused the radio line to disappear. Therefore, by constraining when the line was present or not present, we can learn indirectly about the first galaxies and how they evolved in the early universe." Because the amount of stretching, or redshifting, of the 21 cm line increases for earlier times in the Universe's history, the disappearance of the inter-galactic hydrogen gas should produce a step-like feature in the radio spectrum that Bowman and Rogers measured with their experiment. The next generation of large radio telescopes is under construction right now to attempt much more sophisticated measurements of the 21 cm line from the EoR. Bowman is the project scientist for one of the telescopes called the Murchison Widefield Array. According to him, the most likely physical picture for the EoR looked like a lot of bubbles that started percolating out from galaxies and then grew together – but that idea needs to be tested. If lots of galaxies all put out a little bit of radiation, then there would be many little bubbles everywhere and those would grow and eventually merge like a really fizzy and frothy foam. On the other hand, if there were just a few big galaxies that each emitted a lot of radiation then there would have been only a few big bubbles that grew together.